Shimadzu, one of the world leaders in analytical instrumentation, has released its Prominence Inert LC system, a metal-free instrument ideal for analyzing aggregates or other biological macromolecules in biopharmaceuticals. Prominence Inert LC uses PEEK resin and other non-metal materials for all surfaces of the flow lines in contact with sample solutions and mobile phases. This ensures reproducible analysis even of compo­nents at risk of their activity changing due to contact with metal. Biopharmaceuticals are based on biologically-derived proteins which can denature, triggered by a wide variety of factors during their manufacturing process. If the micro­particles in biopharmaceuticals combine to form aggregates due to elapsed time, me­chanical stimulation, temperature changes or other factors, this can not only decrease drug efficacy but even cause serious adverse effects. Analysis of these aggregates dur­ing new biopharmaceutical development is therefore critical. As the mobile phases for such analytical and preparatory processes for biological macromolecules use high concentrations of sodium chloride or other halogen salts, stainless steel surfaces in the instrument or flow lines can cause several problems. These include corrosion that interferes with analysis, or combination of the proteins with dis­solved metals, thereby losing their original characteristics and functionality. Conse­quently, there is an increase in demand for metal-free LC systems for biopharmaceutical development and quality control. By using inert (resin) materials for all flow line surfaces in contact with sample solutions and mobile phases, the Prominence Inert LC system offers high resistance to corrosion by halogen ions during aggregate analysis. At the same time, it also features the high reliability, robustness and expandability that are characteristic of Prominence high-per­formance liquid chromatography systems. It can be used with mobile phases having high salt or acid concentrations while inhibiting the adsorption of samples with a high affinity for metals. The system includes the new LC-20Ai inert solvent delivery pump. The LC-20Ai features a newly improved delivery control mechanism reducing baseline detector noise while achieving precise solvent delivery performance in order to enable highly reproducible aggregate analysis results. The LC-20Ai provides stable solvent delivery performance for flow rates ranging from 0.001 to 10.00 mL/min and improved operability with features such as VP functionality for supporting instrument validation and maintenance proce­dures. When used in analysis of bromic acid or combined cyanide/bromic acid, the LC-20Ai can significantly reduce baseline noise caused by pulsation when delivering post-column reaction solution. This increases the reliability and quantitative accuracy of high-sensi­tivity analysis. Shimadzu, one of the world leaders in analytical instrumentation, has released the metal-free Prominence Inert LC system for analyzing aggregates or other biological macromolecules in biopharmaceuticals. The system ensures that components at risk of their activity changing due to contact with metal materials can be analyzed reliably. 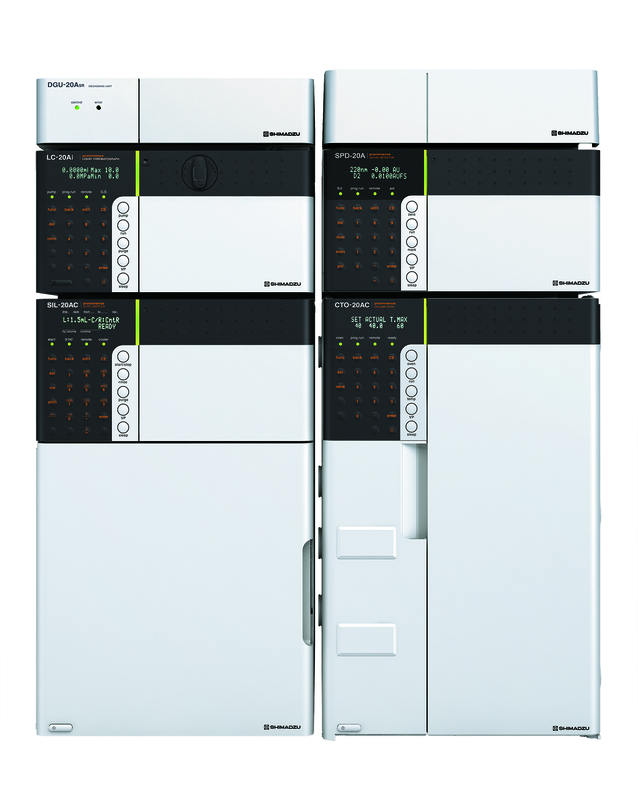 Prominence Inert LC system features the high reliability, robustness and expandability that are characteristic of Prominence high-performance liquid chromatography systems.